Over the Fourth of July holiday, we often spend a week with my in-laws at their cabin in the Poconos of Pennsylvania. Their house is nestled in the woods near a lake and several streams. There is always much fishing, hiking, biking, swimming, and blueberry picking while we are here. After a good rain, the kids love to hunt for little orange salamanders that suddenly appear. There is little TV, lots of games–many of them silly games made up by the family over the years–and plenty of food. It is a tradition to enjoy dinner along one of the streams at least once during the week. 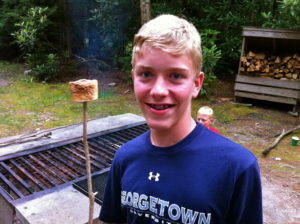 We fly fish, grill over an open fire, and toast marshmallows for s’mores. The following recipe has become a favorite of my in-laws since I first made it for them a few summers ago and is perfect vacation food: easy to prepare in amounts for any size group. The 3-ingredient A Third-A Third-A Third Marinade for grilled chicken was an idea from a friend years ago and has been a consistent crowd-pleaser over the years. When people ask for the recipe, they usually can’t believe how easy it is. My dad–who does not cook–recently started making this. Trust me, that says something! I prepared this easy marinade after breakfast and let the chicken steep all day. I reserved a small amount of the mixture and used it to marinate thick slices of onions, zucchini, and portobello mushrooms for about an hour before grilling. That proved to be a very good way to get people excited about eating their veggies! A big tossed salad rounded out the meal perfectly. Until last year, this chicken had no official name. Someone dubbed it “Foot Bridge Chicken” in honor of the pretty spot along the stream where we cooked out that evening. They caught nine fish between them! 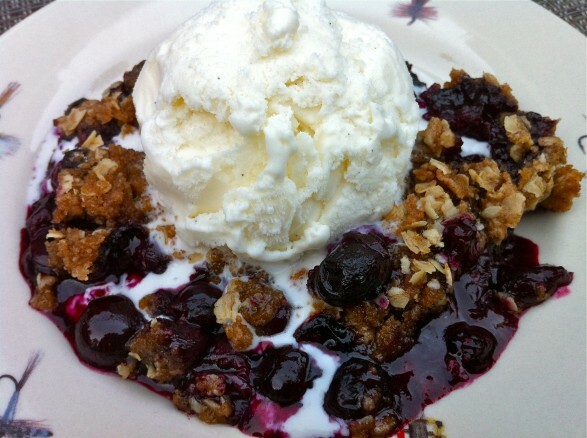 “Blueberry Jammie” is a dessert we have been enjoying for many years on this vacation and is reason to pick blueberries daily. With the cooler weather we had this spring, the blueberries are a little behind, so we may have to supplement with frozen to get our fill this year. We have been known to make quite a few batches! Click here for the recipe and to find out the reason for the goofy name! 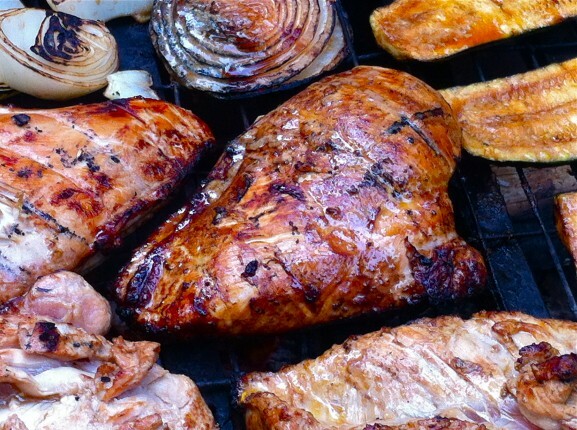 Depending on the amount of chicken you wish to grill, you may adjust the total quantity of marinade as needed. Simply use equal parts of each ingredient. Make a little extra of the mixture if you'd like to use it as a marinade for vegetables. I typically marinate veggies for about an hour prior to grilling. Mix the first three ingredients in a large bowl or zipper-top bag. Add desired amount of chicken and marinate for several hours or up to all day. Grill over medium-high heat until chicken is just cooked through. I tried this marinade last night. This recipe will be my new go to for marinade. I really liked it. Used it on boneless skinless breasts and it made a big difference on how they came out. They were juicy and delicious. We tried this recipe this past weekend! OMGoodness we loved it and it will be our new recipe for marinade. Fast and easy and I know what’s in the ingredients! Oh yay! Thanks for letting me know, Denise. I’m so glad you enjoyed! made it for last night’s dinner. Delicious! Happy it was a hit, Nora! The chicken sounds wonderful, but what caught my eye was mentioning salamanders. Since I went to camp in the Poconos when I was 5, begged to stay two months that first year and did, also for about 9 years after that, I spent many hours finding salamanders. I’m so glad to hear they are still there. I have never seen or heard of them any other place. People may call what they find salamanders, but I don’t think they are the very orange fellows near and dear to my heart that seem unique to the Poconos. What touched my heart too was about the rain and the salamanders. Growing up my parents owned a cabin on a lake in upstate NY and we would spend the entire summers there and fish and swim and eat the best tomato sandwiches and the very best corn on the cob And also look for salamanders after it rained. Great story Ann. Thank you for the great comments, Kenny and Sherry. It’s so neat when such a little thing can elicit such wonderful memories! 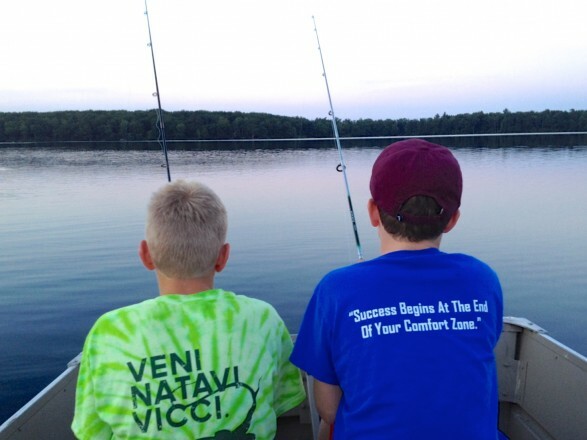 I, too, have many fond memories from my summer camp days and my boys so enjoy going to camp every summer. 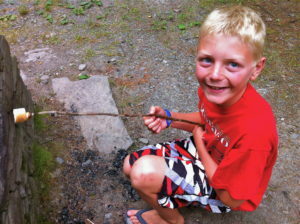 They have every boy’s dream at their camp–a frog pond! And tomato sandwiches…soooo good!